Home > Blog > Romantic Hairstyle For Valentine’s Day! Romantic Hairstyle For Valentine’s Day! Valentine’s Day is coming soon and you want to look stunning! Stop wondering! I’ve found the perfect hairstyle for a romantic date with your lover! 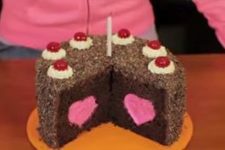 How To Make The Portal Cake For Valentine's Day! Make Your Inside-Out Grilled Cheese Sandwich!